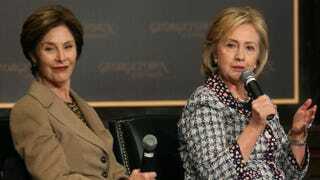 Former first lady Laura Bush and former Secretary of State Hillary Clinton participate in an event to honor the women of Afghanistan at Georgetown University in Washington, D.C., on Nov. 15, 2013. The two do share membership in the very exclusive First Lady Club. But of course, it’s not that superficial. Former first lady Laura Bush recently hinted she would rather vote for former Secretary of State Hillary Clinton over Donald Trump, saying that she wants the next president to be someone who cares about women in Afghanistan, The Telegraph reports. Bush made her comments during the annual Women in the World summit held in New York City last week, a gathering of female business leaders, politicians, activists, entrepreneurs and firebrand dissidents from around the globe. Her words, although not explicitly endorsing any candidate, had a very “read between the lines” quality about them; Bush was also very careful not to exclusively use the pronoun “he” when speaking about the next president. “I want our next president—whoever he or she might be—to be somebody who is interested in women in Afghanistan and who will continue U.S. policies … that we continue to do what we’re committed to do as a country,” she said, as she appeared onstage with her twin daughters, Jenna and Barbara. There is apparently no Afghanistan policy from either Donald Trump or Sen. Ted Cruz, two of the Republican presidential contenders. So there’s that. More tellingly, Bush recently published a book on Afghan women in conjunction with her husband’s George W. Bush Institute, and Hillary Clinton was among those who offered a cover endorsement for the book, according to The Telegraph. “For over a decade, Laura Bush has been an ally and advocate for the women of Afghanistan and, in particular, has worked to ensure that the voices of Afghan women are heard,” Clinton wrote. The report also notes that the Democratic front-runner visited Afghanistan four times during her stint as secretary of state.